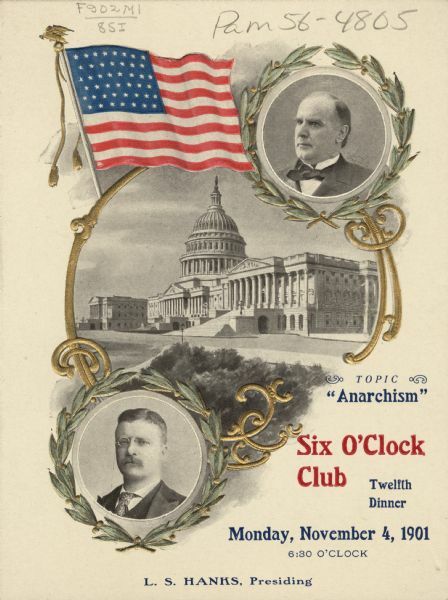 Front cover of the announcement for the twelfth dinner of the Six O'Clock Club, with circular head and shoulders portraits of Presidents William McKinley Jr. and Theodore Roosevelt, both framed with laurel wreaths, the flag of the United States, and a three-quarter view illustration of the U.S. Capitol in a golden frame. The flag, gilt frame, and laurel wreaths are embossed. This dinner took place six weeks after the assassination of President McKinley and after President Roosevelt assumed office. The Six O'Clock Club was a men's social and dining club, centered on topics of political and civic interest. For other Six O'Clock Club menus, see also 102830, 103636, 103640, 103723, 103782, 103784, 103797, 103798, 103802, and 103805.